I negotiated the smokers blocking the front door and stood at the bar doing a fair impression of someone who wants to buy a drink. No bar staff in sight, so went elsewhere after a few minutes. Tried again next day, same smokers. I did get a pint this time however, Butcombe bitter, too cold but OK. I had a look round and a lot of people seem to drink lager here. All in, beer not great, atmosphere not great, score not great 4/10. Spent a nice Sunday afternoon in here. Good beer, good service and interesting crowd. Would happily return. Smashing little pub that does beer and cider stillaged behind the bar straight from the barrel. Beers on handpump are localish from SW breweries such as Otter, Sharps and Branscombe Vale (though they don't seem to do Palmers, which given the brewery monopolisation of pubs a few miles east of here isn't such a bad thing!) and always with something interesting. Food looked unusual and haven't yet tried but all in all well worth the steepish climb from the seafront. 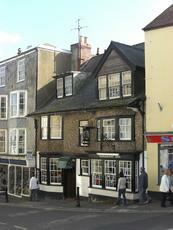 Lyme Regis has a few decent pubs but no particular stand out and this is no exception although it might just be the best. I don't think the blazing July day on which we visited in July 2013 was the best as the cosiness of the right hand bar seemed tailor made for sea dogs wearing sou'westers and chunky jumpers. 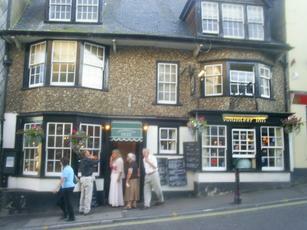 A pint of Otter negotiated my gullet without problems and the food in the left hand, more restauranty bar looked good. A traditional pub just up the hill from the centre of town, this seems to be a decent boozer with a more traditional feel than many of the nearby options which on the whole seem to be rather down at heel or overly touristy. Only a wet dog smell subtracted slightly from the ambience. The main bar to the right is a long, carpeted room with the walls being a mixture of exposed stone work and black wood panelling. The ceiling was a mustard colour and had plenty of black beams which were all adorned with blue and white fairly lights. A stone fire-place was on the right and the bar counter was opposite this, clad in what appeared to be some sort of wood effect Formica. A large mirror and a few old black and white pictures of the local area completed the decor and the seating was wooden benches with green cushions and green padded stools. The other bar to the left was an entirely different, contemporary affair with more of a bistro like feel to it. I assume this is for dining, although nobody was in here on a recent visit. The floor here is sanded wood, there is a white-washed brick fire-place with a wood burning stove, pale blue/green wood panelling on the walls and chunky pine tables. Beers on tap were Adam Henson�s Rare Breed from Butcombe, Tribute and Dartmoor Best. Ciders were Ashton Press, Cornish Rattler, Thatcher�s Dry and Thatcher�s Copper Press which was a new one on me � slightly embarrassing that I have to come all the way to the south coast to find it when I only live about ten miles from the brewery (cidery? ).